The Commodore Hotel 5100 Estero Blvd. 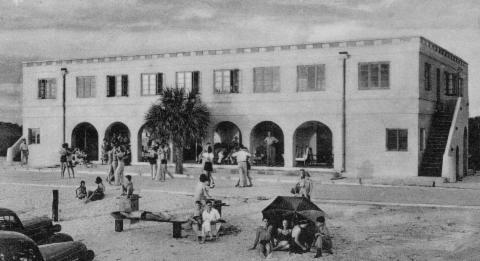 When the Commodore Hotel was built on Ft. Myers Beach in 1938, it was the fourth island hotel on the beachfront, as seen here. Previously, the Winkler Hotel was the first in 1912, and a boarding house was available nine years later at a dollar a night for workers constructing the first canal and bridge to the island. The second hotel was built at this time, named the Gulfshore Inn, followed by the Pelican, as the third hotel. Today all four are noted as early island landmarks. The Commodore began when good friends Cyril Shawcross and Guy Holliday flipped a coin to see who would develop their gulf front and bayside properties. As it happened, Cyril and his wife Ethel won the beachside site, as seen below. It was Cyril and Rhett Smith who completed this large, modern structure. 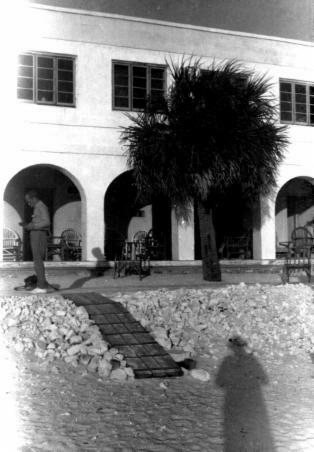 It was built with beach sand, coquina and limestone rock using a cinder block mold, making two blocks at a time. The Commodore opened with an elaborate dining room and sandwich shop, and immediately added the beachside cottages, as seen above. During the 1940's during the WWII years the Commodore Hotel was a hub of activity when busloads of military were brought to the beach for R&R. On Sunday afternoons, buses left directly for the airbases in Fort Myers, and the Commodore provided bathhouses, ice cold sodas and beer, chili and cheese hotdogs and hamburgers, while dancing was always popular on the gulf front patio. Meanwhile Guy Holliday, who won the bayside property in the coin toss, was busy dredging and redredging his property. He opened his "Holliday Shores" subdivision in 1953. Years later it was renamed "Holiday Shores" when new residents thought they were correcting a spelling error, unaware the subdivision had been named for the owner (oops!). In time, the Commodore Hotel also relinquished its name and site. 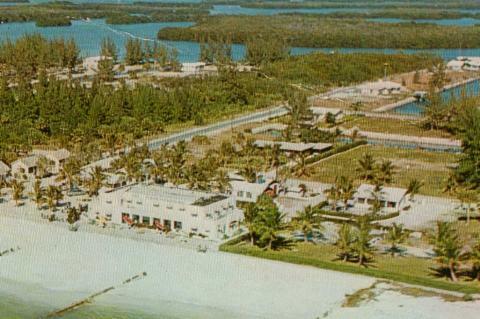 After years of severe hurricane damage, the elegant rebuilt hotel's large dining room, cocktail lounge, recreation room and elaborate sundeck overlooking the Gulf with 17 additional beach cottages and roadside efficiencies, was replaced with "Smuggler's Cove" condominiums on the coin toss site of the island's fourth beachside hotel.